We mixed history with birding by visiting the world-famous Monte Albán archaeological site! Photo by guide Cory Gregory. It was my pleasure to join Dan and all of you for this week-long exploration of the Oaxaca area. We enjoyed a variety of habitats, elevations, some impressive cultural sites, amazing food, a giant tree, and even a bird or two! 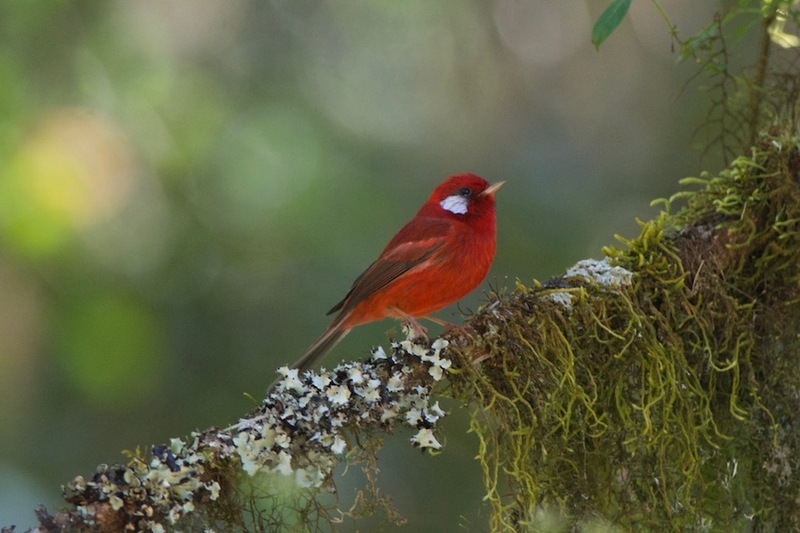 From the dry and scrubby valley floor to the cloud-forests dotted with pines and firs, the habitats yielded an impressive variety of birds, many of them endemic to Mexico. What a fantastic way to spend a week in February! Dawn on Day 1 and we were off to the east towards the Teotitlán del Valle area. It didn’t take long to spy Crested Caracaras overhead (and even a hot-air balloon or two!). Our first stop in the dry valley bottom netted us some superb Mexican endemic birds like Gray-breasted Woodpecker, White-throated Towhee, and Boucard’s Wrens. Farther up the slope we visited the oasis of Presa Piedra Azul where new birds came fast and furious; a variety of ducks (including two very rare Hooded Mergansers), grebes, shorebirds, and even some kingfishers were waiting to be sorted through. Around the edges of the reservoir, we saw the very handsome Bridled Sparrow, a squeaking Thick-billed Kingbird, and the eye-burning Vermilion Flycatcher. Higher up in elevation, we enjoyed sightings of Elegant Euphonia, the popular Red Warbler, Chestnut-capped Brushfinch, Collared Towhee, Orange-billed Nightingale-Thrush, Mountain Trogon, and the amazing Chestnut-sided Shrike-Vireo. What a start to the trip! Our second day took us past Pollo Niño for some scrub birding where we chanced into several tough endemics: Dwarf and Slaty vireos, Oaxaca Sparrows, and more Boucard’s Wrens. We continued uphill until we reached La Cumbre (about 10,000 feet in elevation) where the quiet and peaceful pine forests dominated the landscape. This unique habitat yielded a new variety of birds like Spot-crowned and Strong-billed woodcreepers, Russet Nightingale-Thrush, Mexican Chickadee, the arboreal Gray-barred Wrens, and even a couple of the highly-localized Dwarf Jays. It was this afternoon that we had a great experience with some (almost) visible Long-tailed Wood-Partridge (groan). The next day was an exploration into yet another different habitat; we headed towards the coast, down in elevation, to the KM 77 area. Hiking up the dry, desert wash put us in great position to see specialties like Russet-crowned Motmot, Green-fronted Hummingbird, Rufous-naped Wren, White-lored Gnatcatcher, Varied Bunting, and a great study between Ash-throated and Nutting’s flycatchers. Although breezy and warm, the visit to the radio towers on our return drive was interesting. We had our first taste of Ocellated Thrasher behavior (sneaky! ), saw a few distant Woodhouse’s Scrub-Jays, and a skulky Audubon’s Oriole. We relaxed in the afternoon by visiting the ruins of Mitla and Yagul where Jorge gave us fantastic walking tours. The world-famous ruins at Monte Albán awaited us on our fourth day. We started early by birding the nearby trails and hillsides and were floored by our amazing luck with Ocellated Thrasher! One was up and singing and we all enjoyed amazing scope looks at this highly-localized endemic (nearly confined to the state of Oaxaca). We then enjoyed a very informative trip through Monte Albán led once again by our guide Jorge. The ruins provided more than just a history lesson though; we saw some fun species like Zone-tailed Hawk, Bushtit, and even an out-in-the-open Grasshopper Sparrow! That evening some of us ventured up to the high reaches of La Cumbre for a picnic dinner and some nighttime exploration. Although chilly, we were rewarded with a smashing mix of night birds such as three Flammulated Owls (including awesome looks at one singing), 3 Fulvous Owls, a great look at Whiskered Screech-Owl, and even some Mexican Whip-poor-wills to boot! We revisited the scrub and forests above Teotitlán on our 5th day. This time we were able to get down to business and found some responsive Lesser Roadrunners, West Mexican Chachalacas, “Dickey’s” Audubon’s Oriole, Blue-throated Hummingbird, and a shy White-striped Woodcreeper. Lunch was at the amazing Restaurante Tlamanalli where the Mendoza sisters showed us their traditional weavings. Our final day of birding was in the highlands near La Cumbre where we ventured down the Yuvila Road. We enjoyed new species like Red Crossbill, Black-headed Siskin, Rose-throated Becard, and a stunning view of the “Mountain” race of Northern Pygmy-Owl. A leisurely lunch at the Calibri restaurant provided us with our first Common Ravens, a moth that preferred Bart’s sleeve, and a Magnificent Hummer or two. All in all, it was a successful trip and Dan and I would like to thank all of you for being so much fun to bird with. It was a pleasure spending a week in this glorious part of Mexico, basking in the sun, watching endemic birds, and eating the unique cuisine (chapulines, anyone??). We hope to see you again on a future tour and until then, good birding to “owl” of you! LEAST GREBE (Tachybaptus dominicus) – Presa Piedra Azul was teeming with this tiny, all-dark grebe. True to its name, this is the world’s smallest grebe species! GREAT BLUE HERON (Ardea herodias) – At least one or two of these familiar herons were chillin’ like villains on the edge of Presa Piedra Azul. GREAT EGRET (Ardea alba) – These graceful and long-necked egrets were also seen fishing on the edges of Presa Piedra Azul. 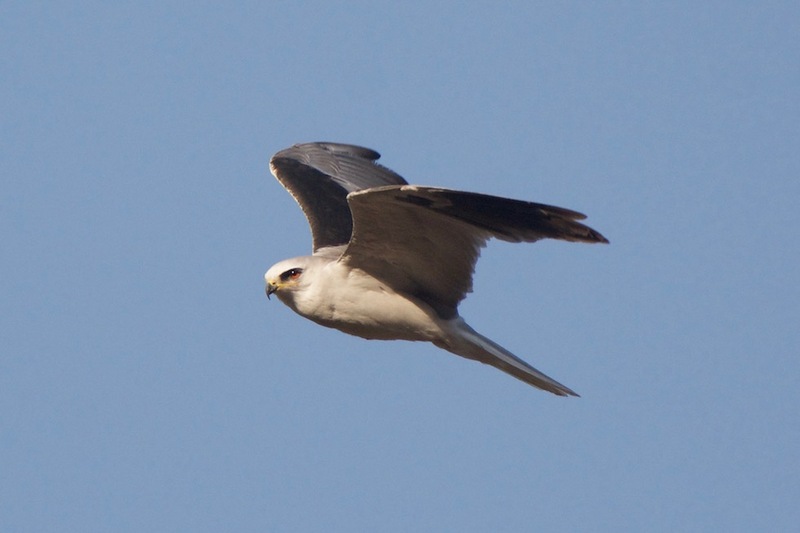 This White-tailed Kite at Monte Albán gave crippling looks as it hunted over our heads. Photo by guide Cory Gregory. SNOWY EGRET (Egretta thula) – Although smaller than the previous two species, this white egret has yellow “slippers”. Seen a couple of times at Presa Piedra Azul. LITTLE BLUE HERON (Egretta caerulea) – Although this rare heron is not seen every year on this tour, we had good luck in finding one at Presa Piedra Azul. CATTLE EGRET (Bubulcus ibis) – Not as restricted to wetlands as the previous four species, this small, white egret was seen several times in grasslands, often in the vicinity of cattle. GREEN HERON (Butorides virescens) – Although typically less conspicuous than the other herons, this species was spied on the shores of Presa Piedra Azul on both days that we passed by. BLACK VULTURE (Coragyps atratus) – This short-tailed vulture was seen overhead at various points on most days. TURKEY VULTURE (Cathartes aura) – This was the most widespread species vulture on tour. WHITE-TAILED KITE (Elanus leucurus) – We all enjoyed watching this graceful raptor overhead from the trails near Monte Albán. This species is an expert hoverer and we got to witness this type of flying as it hunted. SHARP-SHINNED HAWK (Accipiter striatus) – This small accipiter put in a couple of brief appearances including Day 1 above Teotitlán del Valle. The small size and squared-off tail help separate this species from the following species. COOPER'S HAWK (Accipiter cooperii) – Bigger than the preceding species, this hawk was seen a couple of times including once from the front of our hotel! Some folks in the first van caught a glimpse of another as we drove into the Yagul ruins. One of the surprises on tour included this Gray Hawk, a rare raptor in the Oaxaca Valley. Photo by guide Dan Lane. WHITE-TAILED HAWK (Geranoaetus albicaudatus) – A very attractive species of open grasslands, this broad-winged raptor was first seen during our U-Turn to go back for the Gray Hawk. We would see more later on including a pair at Monte Albán. 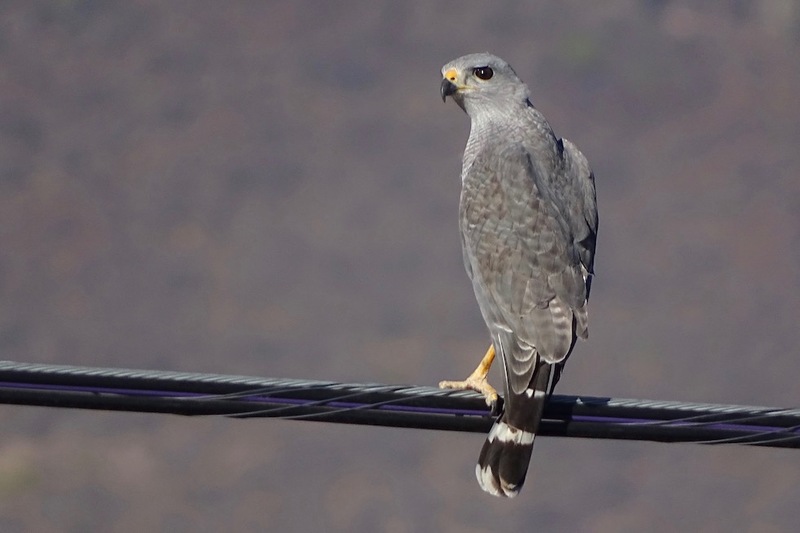 GRAY HAWK (Buteo plagiatus) – This rare winter visitor to the Oaxaca Valley took us by surprise. We spotted this same bird twice, both times perched on a power line outside of Oaxaca City. SHORT-TAILED HAWK (Buteo brachyurus) – One of these tropical buteos was seen overhead while we were visiting the Mitla ruins. ZONE-TAILED HAWK (Buteo albonotatus) – This fascinating, vulture-look-alike was spotted twice during our trip; first over Monte Albán (carrying prey, no less!) and again at higher elevations along the Yuvila Road. RED-TAILED HAWK (Buteo jamaicensis) – This familiar species was seen several times throughout our visit; sometimes high above the ridges uphill from Teotitlán del Valle, sometimes on power line poles down in the valley. KILLDEER (Charadrius vociferus) – A lone Killdeer was seen on the backside of Presa Piedra Azul on our first day. INCA DOVE (Columbina inca) – Although misnamed (the Incas didn't live in Mexico, the Aztecs did), this little, scaled species was seen most days, sometimes right around our hotel. WHITE-TIPPED DOVE (Leptotila verreauxi) – This larger, more secretive dove was spied only a few times including a brief look on our KM 77 hike. Unfortunately the views were brief and not everyone saw it. 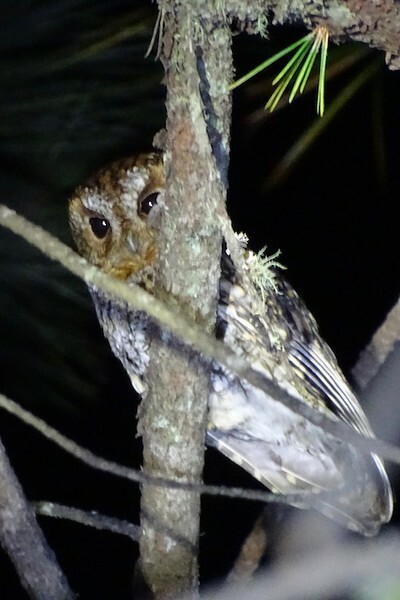 This Whiskered Screech-Owl on the slopes of Cerro San Felipe was one of 8 individual owls found on our owling trip! Photo by guide Dan Lane. WHITE-WINGED DOVE (Zenaida asiatica) – Seen every day on tour, this common species was widespread in urban and rural areas alike, especially at lower elevations. MOURNING DOVE (Zenaida macroura) – Certainly not as common as other doves in the Oaxaca area, this species was still seen several days, often as flybys. The distinctive wing-whir as they launch into flight is a solid give-away to their presence. LESSER ROADRUNNER (Geococcyx velox) – It took a fair bit of work but we were eventually rewarded with an outstanding show of two counter-singing roadrunners above Teotitlán del Valle. At one point, one of the birds even glided in over the hillside! This is a retiring species that can be tough to find when you want to. FLAMMULATED OWL (Psiloscops flammeolus) – Our owling adventure yielded no fewer than three of these montane, year-round owls. Our final stop that evening was highlighted by one that came into view and continued to sing for several minutes. Wow, what a treat! 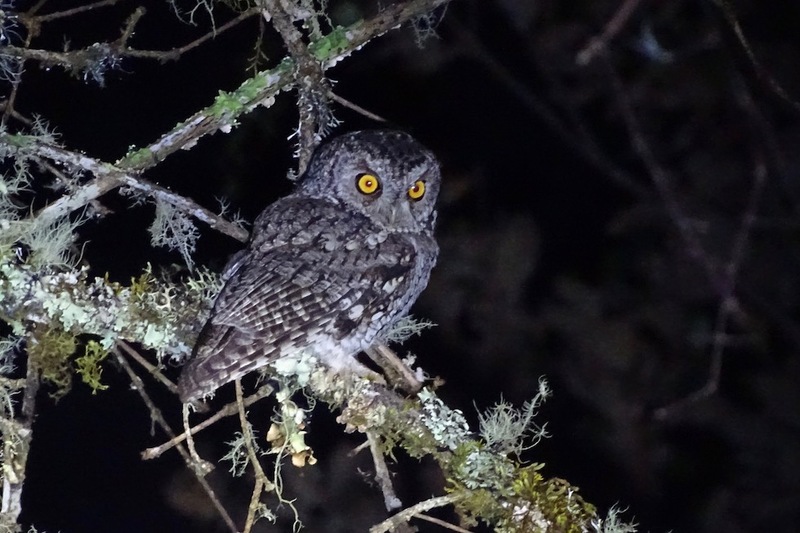 WHISKERED SCREECH-OWL (Megascops trichopsis) – Another splendid find on our nocturnal quest for night birds, this species prefers oak or oak-conifer highlands. NORTHERN PYGMY-OWL (MOUNTAIN) (Glaucidium gnoma gnoma) – This tiny, diurnal owl finally came into view on our last day along the Yuvila Road on Cerro San Felipe. The “Mountain” subspecies, G. g. gnoma, is actually the nominate race for this wide-ranging species. FULVOUS OWL (Strix fulvescens) – Although it wasn’t clear for many years which Strix species was present in the La Cumbre area of Cerro San Felipe, we now know that Fulvous is a safe bet. 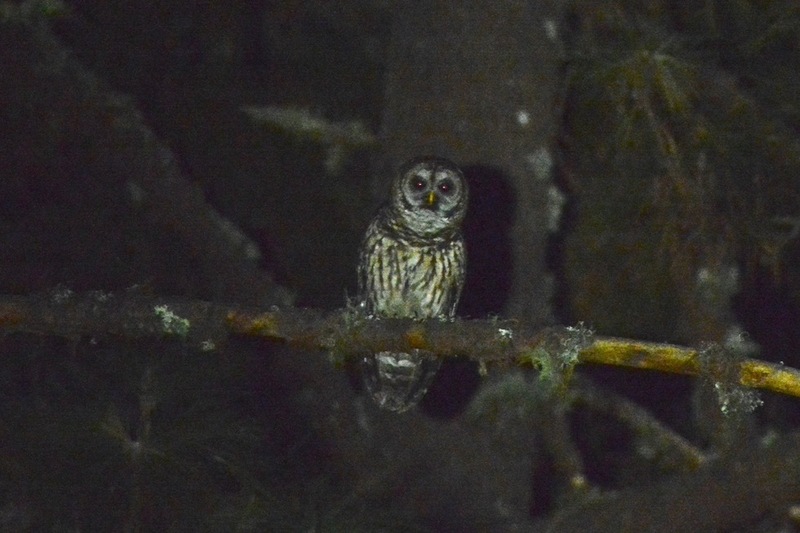 We found three of these mysterious owls on our night trip including a duetting pair! MEXICAN WHIP-POOR-WILL (Antrostomus arizonae) – This species was considered part of the Whip-poor-will complex until 2011 when it was given species status. We found a couple of these on our way down Cerro San Felipe on our owling trip. WHITE-THROATED SWIFT (Aeronautes saxatalis) – We chanced into one of these high above Teotitlán del Valle. This species, which is sometimes missed on Oaxaca tours, is often considered one of the fastest flying birds. MEXICAN VIOLETEAR (Colibri thalassinus) – The Green Violetear was recently split into two species: the Lesser Violetear from Costa Rica southward, and the Mexican Violetear from Nicaragua northward. We saw the latter, a highland species, fairly well on our first day to the upper reaches of the Teotitlán del Valle. MAGNIFICENT HUMMINGBIRD (Eugenes fulgens) – We watched this large hummer come in to drink at our final lunch stop at the aptly-named Restaurante Colibri. We saw another along the Yuvila Road. We had a strong showing by the mysterious Fulvous Owls on Cerro San Felipe; we witnessed a pair dueting and heard a third. Photo by guide Cory Gregory. PLAIN-CAPPED STARTHROAT (Heliomaster constantii) – An uncommon species around Oaxaca, an adult was seen feeding a fledged youngster at the Mitla Ruins. Additionally, we spotted another two on our hike near KM 77. BLUE-THROATED HUMMINGBIRD (Lampornis clemenciae) – This large brute of a hummer was heard well and seen briefly as it fed on flowers along the Yuvila Road. Being a fast flyer, however, it didn’t stick around for long. BERYLLINE HUMMINGBIRD (Amazilia beryllina) – Another fairly common hummingbird, these were called out several times including around the hotel and up above Teotitlán del Valle. GREEN-FRONTED HUMMINGBIRD (Amazilia viridifrons) – This species has been reliable around the KM 77 area in recent years. We enjoyed great scope views as one perched out in the open for everyone to see. 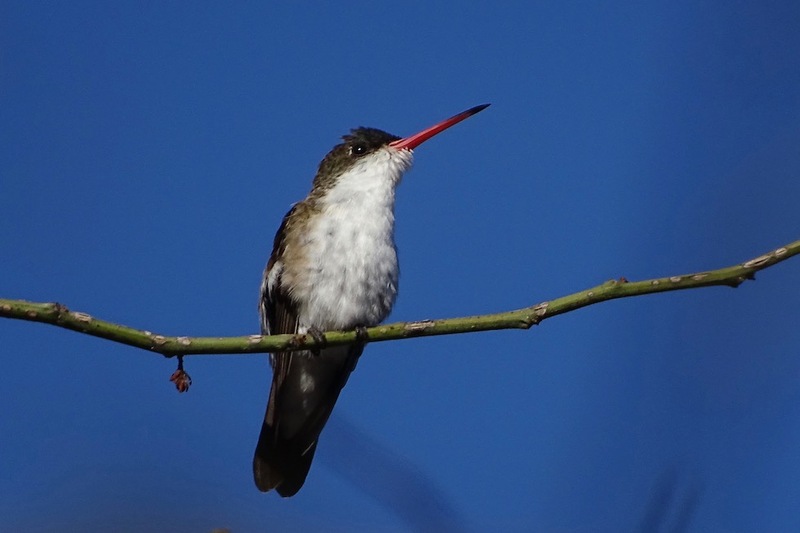 WHITE-EARED HUMMINGBIRD (Hylocharis leucotis) – Striking and common; what a great combo for a hummer! We had quick looks here and there before really settling in on one along the Yuvila Road on our last day. MOUNTAIN TROGON (Trogon mexicanus) – Although similar to the Elegant Trogon found farther north, this is the species we saw on three of our days; first high above Teotitlán del Valle and then twice more in the La Cumbre area. This location is very fitting for a bird named T. mexicanus. It's sometimes a tricky little devil to get looks at, so we were stoked to have this Flammulated Owl come in and sing right in front of us! Photo by guide Dan Lane. RUSSET-CROWNED MOTMOT (Momotus mexicanus) – What a beaut! 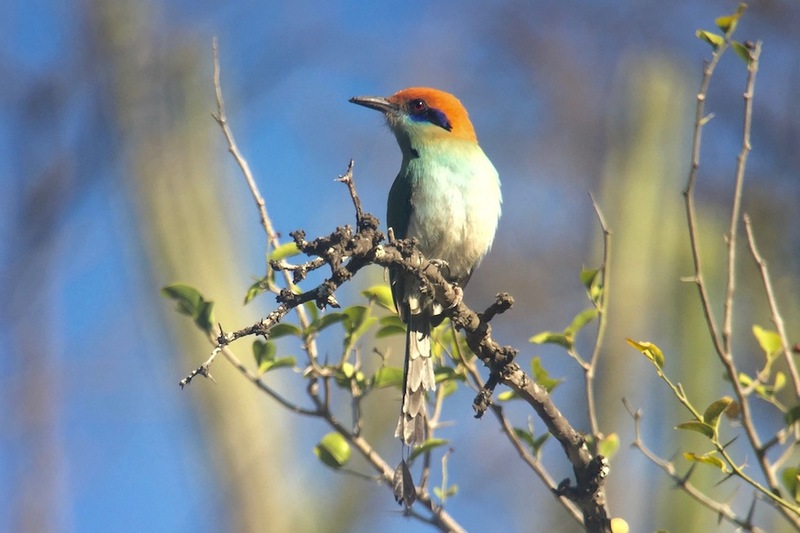 Our hike up the dry wash at KM 77 produced this fantastic motmot. Scope views were had by all! GREEN KINGFISHER (Chloroceryle americana) – Smaller (and greener!) than the previous species, a pair of these were waiting for us at Presa Piedra Azul when we first pulled up. ACORN WOODPECKER (Melanerpes formicivorus) – We had only a brief encounter with this highland species on our first day above Teotitlán del Valle. GOLDEN-FRONTED WOODPECKER (Melanerpes aurifrons) – We were surprised to find this Melanerpes side-by-side with Gray-breasted Woodpeckers on our hike at KM 77. 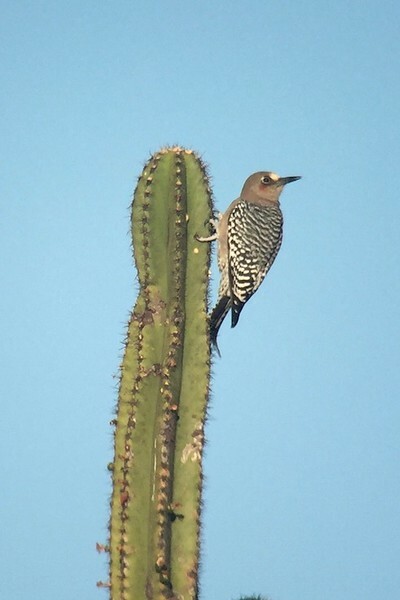 LADDER-BACKED WOODPECKER (Picoides scalaris) – A dry-country species that was seen on three back-to-back days. Our first sighting was from the trail near at Monte Albán. HAIRY WOODPECKER (SOUTH MEXICAN) (Picoides villosus jardinii) – Although the same species as the Hairy Woodpeckers we have in the U.S., this subspecies is limited to southern Mexico and Guatemala. NORTHERN FLICKER (RED-SHAFTED) (Colaptes auratus mexicanus) – Flickers were fairly common at the higher elevations such as the La Cumbre area. 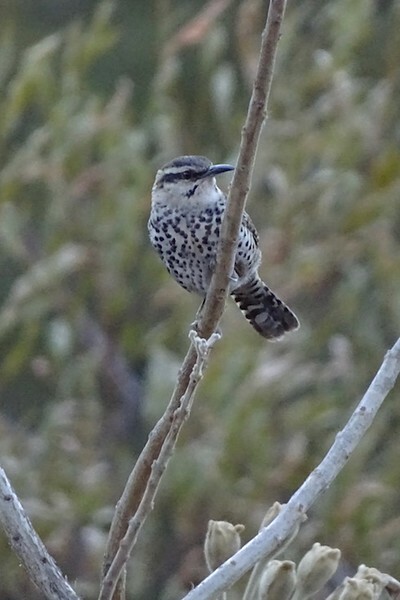 These flickers found in Oaxaca are the southernmost of the "Red-shafted" subspecies (the ones found farther south are known as "Guatemalan" Flickers). CRESTED CARACARA (Caracara cheriway) – This dry-country species was common throughout our time in Oaxaca and was seen nearly every day. AMERICAN KESTREL (Falco sparverius) – It wasn't uncommon to see this small falcon perched on power lines throughout the Oaxaca Valley. PEREGRINE FALCON (Falco peregrinus) – Due to the sharp eyes of Karen and Dan, we turned around and got great looks at two of these impressive predators perched on towers outside of town. The Green-fronted Hummingbird was a special find as we explored the lower elevations near KM 77. Photo by guide Dan Lane. STRONG-BILLED WOODCREEPER (CENTRAL AMERICAN) (Xiphocolaptes promeropirhynchus sclateri) – This population, isolated from the others, sounds quite different (which is rather mysterious). It took some work but we eventually found a pair in the forests near La Cumbre on Cerro San Felipe. SPOT-CROWNED WOODCREEPER (Lepidocolaptes affinis affinis) – This species was spotted on our hike along the Cabeza de la Vaca trail on Cerro San Felipe. Not nearly as large or large-billed as the Strong-billed Woodcreeper. NORTHERN BEARDLESS-TYRANNULET (Camptostoma imberbe) – We heard several (and a couple of them did laps around us) but they hardly ever sat still! This bushy-crested flycatcher prefers the dry washes and scrubby areas. TUFTED FLYCATCHER (Mitrephanes phaeocercus) – Finally, a distinctive flycatcher! Not only is this flycatcher draped in a warm, cinnamon color, it has a big crest too! We saw this species well on our first day above Teotitlán del Valle. GREATER PEWEE (Contopus pertinax) – This large species of flycatcher was seen at several highland locations. BLACK PHOEBE (Sayornis nigricans) – This water-loving flycatcher stayed low in a creek bed just uphill from Presa Piedra Azul. Turns out, this was our only sighting of the tour. A favorite for some, this Russet-crowned Motmot perfomed exceptionally well near the KM 77 site. Photo by guide Cory Gregory. VERMILION FLYCATCHER (Pyrocephalus rubinus) – This retina-burning species added a welcome splash of color at many of our Oaxaca Valley stops. They seemed especially fond of the openness of the ruins like Monte Albán. DUSKY-CAPPED FLYCATCHER (Myiarchus tuberculifer) – Seen on two of our days, this species gives a melancholy "wheeer" call note. NUTTING'S FLYCATCHER (NUTTING'S) (Myiarchus nuttingi inquietus) – We had the good fortune of studying this species at close range on our Pacific Slope hike near KM 77. Although very similar to the previous species, Nutting's have browner cheeks and rufous all the way down the underside of the tail. GREAT KISKADEE (Pitangus sulphuratus) – This vociferous species was commonly heard (and eventually seen) around our hotel. SOCIAL FLYCATCHER (SOCIAL) (Myiozetetes similis pallidiventris) – Although superficially similar to the kiskadee, this is a smaller species with a much smaller bill. We found a pair of these just uphill from Presa Piedra Azul on our first day. TROPICAL KINGBIRD (Tyrannus melancholicus) – The high-pitched, sputtery calls were heard every day around our hotel. Our trip tallied nearly two dozen species endemic to Mexico! The Gray-breasted Woodpecker, pictured here, is limited to the southwestern corner of the country. Photo by guide Cory Gregory. THICK-BILLED KINGBIRD (Tyrannus crassirostris) – Our first encounter with this stout-billed flycatcher was a calling bird at Presa Piedra Azul but we would go on to see them several more times including at Monte Albán. ROSE-THROATED BECARD (Pachyramphus aglaiae) – Talk about last minute! We found a young male on our last day along the Yuvila Road. Once we keyed in on the vocalization, it was hard NOT to hear it! LOGGERHEAD SHRIKE (Lanius ludovicianus) – Our very first stop as we turned uphill towards Teotitlán del Valle yielded one of these hook-billed predators. 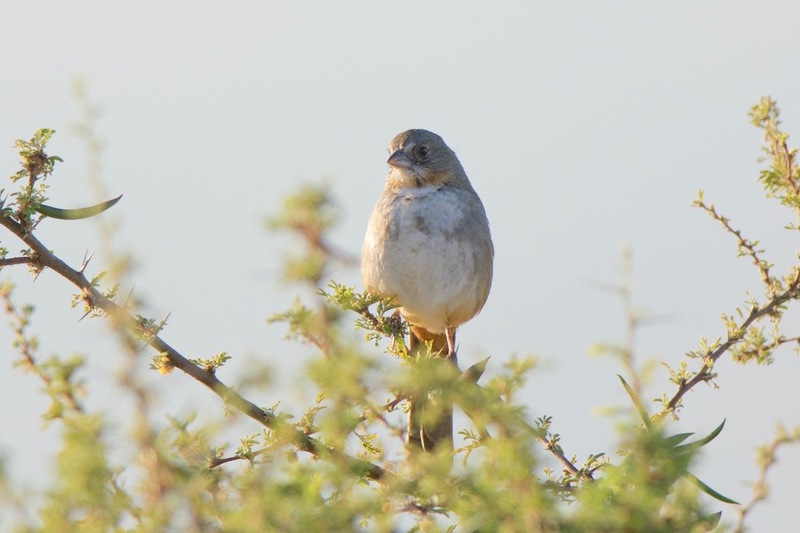 The shrikes in Oaxaca are the southernmost in the Americas. CHESTNUT-SIDED SHRIKE-VIREO (Vireolanius melitophrys) – Voted as a favorite trip bird by a couple of folks, this large vireo put on a great show on our first day above Teotitlán del Valle. Species in this genus, Vireolanius, can be tricky devils to see so it was a special treat to see these so well. HUTTON'S VIREO (Vireo huttoni) – Colored just like a Ruby-crowned Kinglet, this species is a little slower in behavior and has a thicker bill. We saw these on days we ventured to the higher elevations above Teotitlán del Valle and Cerro San Felipe. PLUMBEOUS VIREO (Vireo plumbeus) – This slaty-gray vireo was spotted on our final day as we birded along the Yuvila Road. STELLER'S JAY (CENTRAL AMERICAN) (Cyanocitta stelleri coronata) – This subspecies of Steller's Jay is much bluer than the ones to the north! We had looks at these in the high-elevation pine-oak forests around La Cumbre and Yuvila Road. Whew, talk about making us sweat! 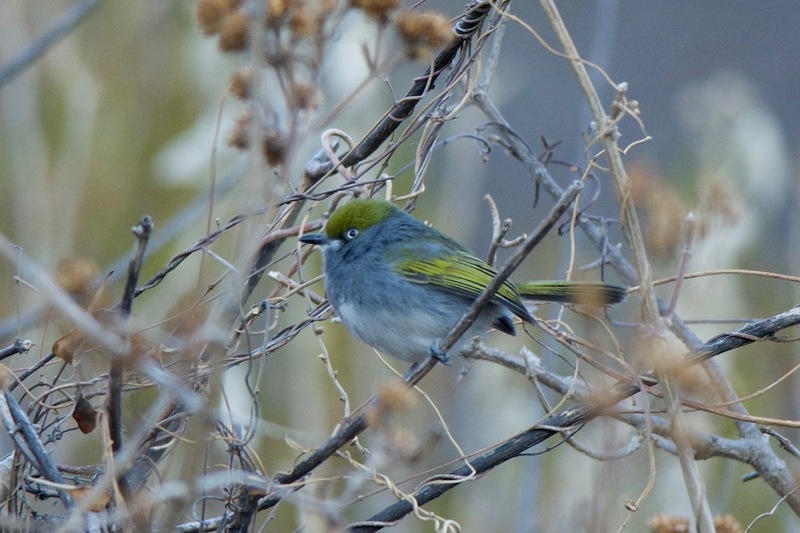 The Mexican endemic Golden Vireo popped into view on our last day. The wait was worth it though! Photo by guide Cory Gregory. WOODHOUSE'S SCRUB-JAY (SUMICHRAST'S) (Aphelocoma woodhouseii sumichrasti) – We heard and then saw this noisy species a couple of times including at the radio towers and then again up the valley above Teotitlán del Valle. Due to recent changes in taxonomy, the "Sumichrast's Jays" are now a subspecies of Woodhouse's Scrub-Jay. COMMON RAVEN (Corvus corax) – We leisurely glanced over our shoulders to see this large corvid flying outside of the Restaurante Colibri on our final day. NORTHERN ROUGH-WINGED SWALLOW (Stelgidopteryx serripennis) – Our first encounter was at Presa Piedra Azul but we saw even more above Monte Albán. VIOLET-GREEN SWALLOW (Tachycineta thalassina) – This was a common species and one we managed to find each day of tour. MEXICAN CHICKADEE (Poecile sclateri) – This denizen of high elevation, conifer forests made appearances during our hike at Cabeza de la Vaca on Cerro San Felipe. BRIDLED TITMOUSE (Baeolophus wollweberi) – I don't remember such wary Bridled Titmice! We pulled in a few of these attractive birds but they hardly perched out in the open for folks. BUSHTIT (MELANOTIS GROUP) (Psaltriparus minimus melanotis) – The roving flock at Monte Albán provided great looks for everyone as they twittered about. The males of this subspecies have vividly black ear patches! WHITE-BREASTED NUTHATCH (INTERIOR WEST) (Sitta carolinensis mexicana) – We found these in the upper reaches of Cerro San Felipe one evening on our owling trip. However, they weren't responsive and stayed mostly out of view for folks. BROWN CREEPER (ALBESCENS/ALTICOLA) (Certhia americana alticola) – A well-camouflaged species, this small inhabitant of conifer forests was seen best on Day 1 above Teotitlán del Valle. ROCK WREN (Salpinctes obsoletus) – There was hardly any better habitat than the amazing rock labyrinths of Monte Albán and Yagul! It wasn't uncommon to hear the ethereal songs bouncing down the steep steps of the temples. The Slaty Vireo, also a Mexican endemic, can be tricky to find when you want to. Luckily we had quick success with this colorful vireo on our second day. Photo by guide Cory Gregory. CANYON WREN (Catherpes mexicanus) – Sure, why not, we'll take a Canyon Wren sighting from the corner of a brick house right off the highway! Turns out, this would be our only sighting of this bright rufous wren. HOUSE WREN (BROWN-THROATED) (Troglodytes aedon brunneicollis) – Although still technically the same species as the House Wrens we have breeding commonly in the U.S., this subspecies both looks and sounds different. We saw some especially well on our last day along the Yuvila Road. BEWICK'S WREN (Thryomanes bewickii) – This long-tailed wren was detected at various locations such as our hotel, the Tule tree, and Monte Albán. RUFOUS-NAPED WREN (Campylorhynchus rufinucha) – This was a bonus sighting during our hike up the desert wash near KM 77. This species prefers the lower, coastal elevations within Oaxaca and we were in range for just that one day. GRAY-BREASTED WOOD-WREN (CENTRAL AMERICAN) (Henicorhina leucophrys festiva) – It was quite difficult getting a glimpse of this tiny and sneaky wren! Our only encounter with one was high up on Cerro San Felipe on the second day. What an outstanding species! This Chestnut-sided Shrike-Vireo made an appearance early on our tour. Photo by guide Cory Gregory. WHITE-LORED GNATCATCHER (Polioptila albiloris) – We were in range for this coastal gnatcatcher during our visit to the lower, Pacific Slope elevations. We had nice looks near KM 77 including multiple males. BROWN-BACKED SOLITAIRE (Myadestes occidentalis) – What is surely one of the more gifted songsters in the world, we enjoyed the downward-spiraling songs in the high-elevation forests. We ended up getting superb looks on our last day down the Yuvila road. ORANGE-BILLED NIGHTINGALE-THRUSH (Catharus aurantiirostris) – As is typical for this skulky species, it was difficult for everyone to see. Our one encounter came on the first day above Teotitlán del Valle. The Boucard's Wren is another localized Mexican endemic that we had solid looks at. Like the Cactus Wrens in the U.S., this species prefers habitats with cacti. Photo by guide Dan Lane. CLAY-COLORED THRUSH (Turdus grayi) – This relative to our robin was seen or heard every day, often right around our hotel. This species was probably introduced to the Oaxaca City area in the 1980s and has thrived since. WHITE-THROATED THRUSH (Turdus assimilis) – We had two surprise sightings of this sometimes-shy thrush; once in the forests above Teotitlán del Valle and another at Pollo Niño. This species can easily be missed on this tour! AMERICAN ROBIN (Turdus migratorius) – Oaxaca is about as far south as this species gets. However, they won't be found on lawns; they are a montane species and one that can be rather shy. We had our best luck around La Cumbre and the Yuvila Road. CURVE-BILLED THRASHER (CURVIROSTRE GROUP) (Toxostoma curvirostre curvirostre) – A pale, sandy brown species, this thrasher was spotted at our very first stop as we turned up towards Teotitlán del Valle. Another was seen a few days later on our lower-elevation adventure near KM 77. NORTHERN MOCKINGBIRD (Mimus polyglottos) – The mockingbirds we saw were about as far south as this species reaches in the Americas. We had nice looks at one near Presa Piedra Azul on our first day. GRAY SILKY-FLYCATCHER (Ptiliogonys cinereus) – A fun and flashy species with a yellow crest, these started out being especially numerous as flyovers. Thankfully we caught up to perched ones at La Cumbre and the Yuvila Road. 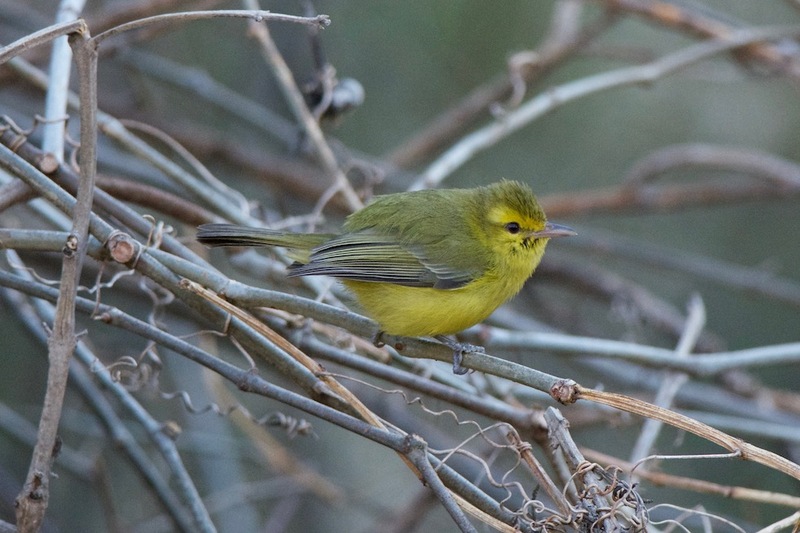 OLIVE WARBLER (Peucedramus taeniatus) – This species, which is a no longer in the wood-warbler family, was fairly common at the higher elevations around La Cumbre. Although they tended to stick to the tree tops, at least one came down a bit along the Yuvila Road. This is a White-lored Gnatcatcher, a species we saw on our day trip to the lower elevations of KM 77. Photo by guide Dan Lane. CRESCENT-CHESTED WARBLER (Oreothlypis superciliosa) – This pine-oak species breeds from Mexico south to Honduras and although they tended to stay high in the trees, we saw a few on Cerro San Felipe. What was surely one of the favorites of the trip, this Red Warbler is an especially brilliant Mexican endemic. Photo by guide Cory Gregory. RUFOUS-CAPPED WARBLER (RUFIFRONS GROUP) (Basileuterus rufifrons rufifrons) – This scrub-loving species is found from Mexico south to Colombia. 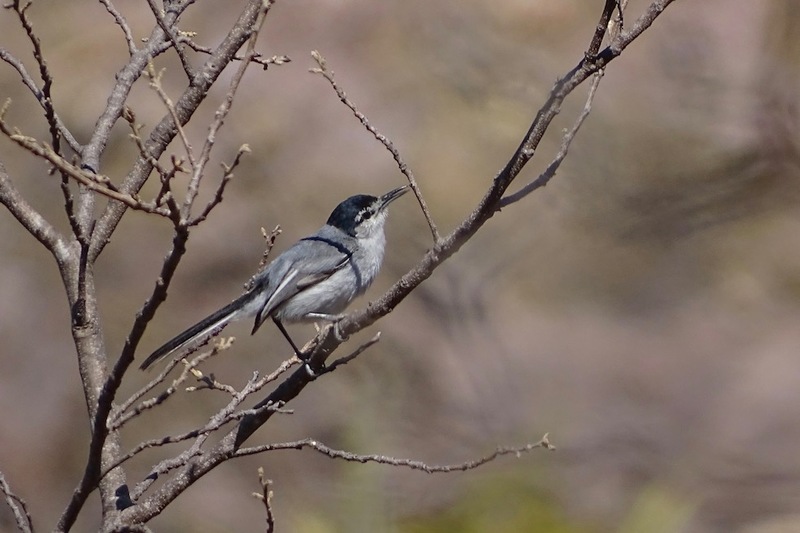 Lucky for us, we saw this attractive warbler almost every day including point-blank looks at Pollo Niño and Monte Albán. GOLDEN-BROWED WARBLER (Basileuterus belli) – A close relative of the previous species, this species is nearly endemic to Mexico. We had our best looks as we worked downhill from the La Cumbre area on our second day of birding. Handsome, endemic, and easy to see... what more could you ask for from a sparrow? These Bridled Sparrows were photographed by guide Dan Lane. PAINTED REDSTART (Myioborus pictus) – You know a species is going to gorgeous when "painted" is in the name! 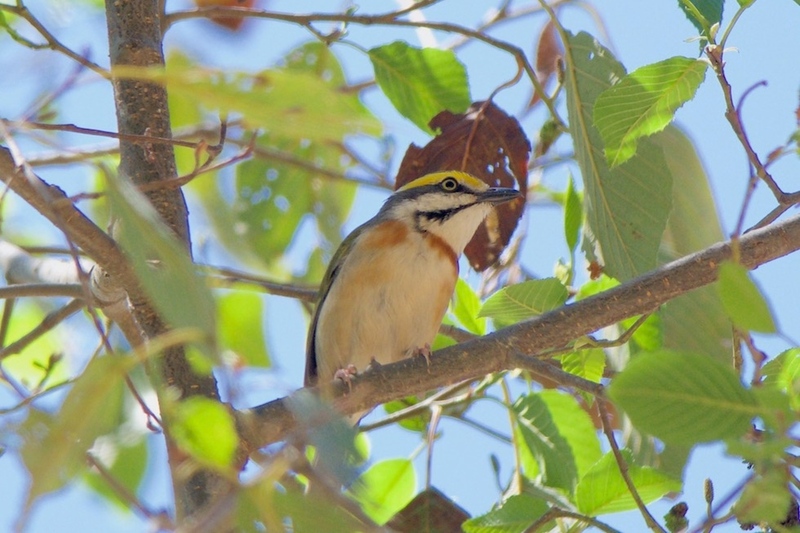 This attractive warbler was seen a couple of days high above Teotitlán del Valle. SLATE-THROATED REDSTART (Myioborus miniatus miniatus) – Seen on most of our visits to the high elevation pine-oak forests. Unlike the previous species, this redstart lacks white in the wings. YELLOW-BREASTED CHAT (Icteria virens) – A rare wintering species that is easily missed on this tour, this tanager-sized bird usually skulks in thickets and riparian tangles. Lucky for us, we spotted two on tour; first on the trail near Monte Albán and another at Pollo Niño. CHESTNUT-CAPPED BRUSHFINCH (CHESTNUT-CAPPED) (Arremon brunneinucha suttoni) – The fluffy white throat really stood out on this large and boldly-colored brushfinch. Staying mostly hidden, the only views came from the La Cumbre area of Cerro San Felipe. YELLOW-EYED JUNCO (Junco phaeonotus) – We don't usually have to work at this species but they were never abundant this time around. Our only fleeting looks were high in the pine forests on Cerro San Felipe. Perhaps the easiest of the Mexican endemics to see, the White-throated Towhee was a welcome sight on Day 1. Photo by guide Cory Gregory. SPOTTED TOWHEE (MACULATUS GROUP) (Pipilo maculatus oaxacae) – A few were seen at the Jilguero area above Teotitlán del Valle but most stayed out of view. 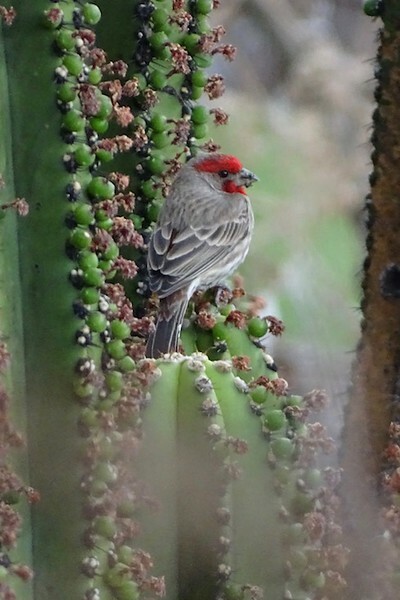 Oaxaca is so amazing... even the House Finches are fun! Seriously though, the subspecies found here are very vividly red! Photo by guide Dan Lane. HEPATIC TANAGER (NORTHERN) (Piranga flava hepatica) – This montane species was seen a couple of times above Teotitlán del Valle and high on Cerro San Felipe. VARIED BUNTING (Passerina versicolor) – A bruise in bird form; this bunting was seen only on our desert walk in the lower elevations of the KM 77 area. EASTERN MEADOWLARK (Sturnella magna) – Our first stop below the town of Teotitlán del Valle turned out to be our only sighting. GREAT-TAILED GRACKLE (Quiscalus mexicanus) – This species was seen every day of tour and mostly in towns. Driving by a roosting flock after dark was quite the cacophony! BRONZED COWBIRD (Molothrus aeneus) – Only seen a few times and often in flight, this species didn't put on a great show for everyone. BLACK-VENTED ORIOLE (Icterus wagleri) – This black-and-yellow species was first spotted from Presa Piedra Azul on our first day. However, we'd go on to see others at Monte Albán and Pollo Niño. STREAK-BACKED ORIOLE (Icterus pustulatus) – Our only glimpse of this uncommon oriole came from our KM 77 hike. ELEGANT EUPHONIA (Euphonia elegantissima) – The blue cap on this species is a nice touch! 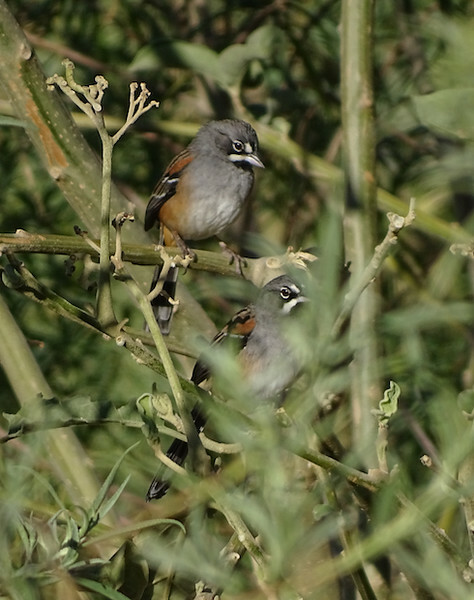 We saw these mistletoe specialists several times at Pollo Niño. HOUSE FINCH (COMMON) (Haemorhous mexicanus roseipectus) – The vividness of the red on this subspecies is so startling that many birders do a double-take! These were quite common at most valley locations. 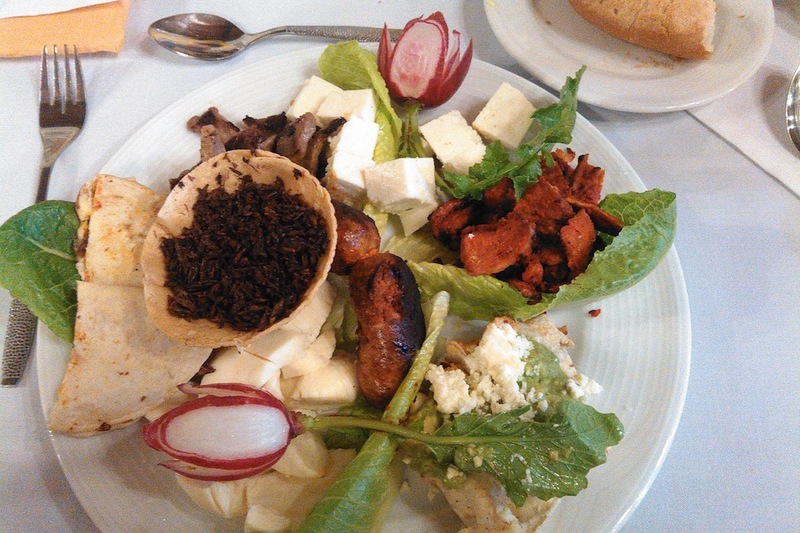 And finally, it wasn't only the birds that made our trip to Oaxaca so fun, the traditional cuisine helped too! This dish, about to be devoured by its photographer, guide Dan Lane, has a full complement of chapulines (grasshoppers)! RED CROSSBILL (Loxia curvirostra stricklandi) – Our last day of birding along the Yuvila Road added this fine finch. Not seen on every Oaxaca trip, we were lucky to have such nice, prolonged looks. When perched next to a silky-flycatcher, which do you look at?! BLACK-HEADED SISKIN (Spinus notatus) – This small finch is found in montane habitats from Mexico south to Nicaragua. We saw several on our last day of birding along the Yuvila Road. LESSER GOLDFINCH (Spinus psaltria) – Although the mournful "tsseeuurrr" call note was often heard, we only saw a few including below Teotitlán del Valle and Pollo Niño. VIRGINIA OPOSSUM (Didelphis virginianus) – We saw the back end of one of these scurry off the road as we were returning from our owling drive. MEXICAN GRAY SQUIRREL (Sciurus aureogaster) – Fairly common on the hotel grounds.